Old farming legends say your corn crop should be knee high by the Fourth of July. But that’s no longer gospel. Far from it. 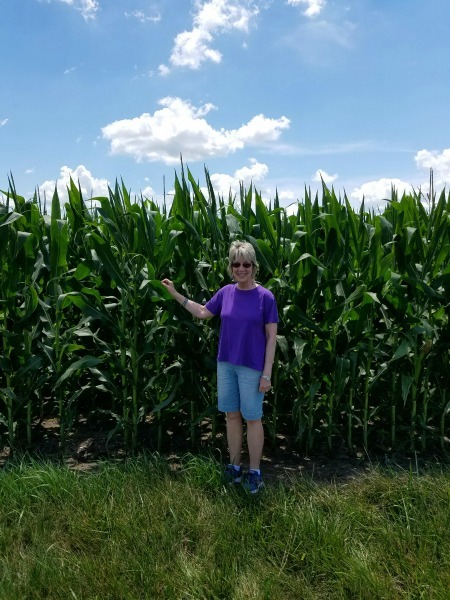 My son Domer was home briefly and took this photo of me standing outside one of the corn fields in our area. As a reference, I’m nearly 5’6″, and this field is starting to tassle way over my head! Farmers attribute earlier planting and nitrogen fertilizer to today’s prolific corn plant heights. The right levels of rainfall at the right times also help. Even then, most farmers say it’s way more important to have high yields than tall plants, but that’s something we won’t know until harvest this fall. I’ll bet you didn’t expect a corny photo today, did you? Not on our nation’s birthday holiday. Happy Fourth of July, friends! I’m taking a few days off to hang with the Domer — see you soon! This entry was posted in Seasonal and tagged corn, fireworks, Fourth of July. Bookmark the permalink. You would need very big knees for that saying to be true! Happy 4th July Debbie – to you and yours. I hope you all have a wonderful time celebrating the birthday of your great country. Much love from this side of the pond! Thank you so much, my friend! There’s a chance of storms, but I imagine the celebrating will go on regardless. Many hugs right back to you! I grew up with that little rhyme, too. I think of it every time I drive past a July Texas cornfield that’s already dry, and ready for harvest. Things do change! Enjoy your time with Domer. It’s summer — time to kick back now and then, and just enjoy! Thank you, Linda. You’re so right … we all need to take a break now and then, especially those of us who work for ourselves. We seem to be the very ones working practically ’round the clock with no vacation plans. And perhaps we’re the ones needing a break the most. Happy Fourth! Now you’ve got me human, “the corn is as high as an elephant’s eye and it looks like it’s climbing clear up to the sky!” Which is a nice thing – I love that song. 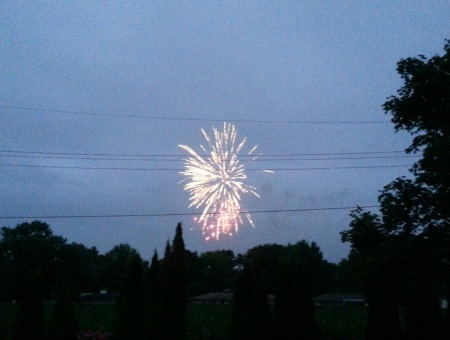 Happy 4th to you and Domer, Debbie. Thanks, Barb. I love that musical, too. Parts strike me as a bit on the corny side, but the music is definitely catchy. Enjoy our nation’s birthday party! WOW Debbie, I cannot believe how HIGH those corn stalks have grown, they’re beautiful! Great photograph, btw!!! I love the contrast between the green stalks and the blue sky and clouds. Wishing you, Domer, and Dallas a Happy 4th of July! Ah, Ron, you’re in the midst of perhaps the best celebrations, and I know you’ll enjoy it for all of us. It’s odd, but every field I drive by has corn of varying heights, probably differing in when it was planted and in the type of seed used. We picked this one because there looked to be a “clean” spot for me to stand — I don’t much like snakes and didn’t want to chance an encounter with one in some of the taller spots, ha! Happy fourth, Debbie. Corn on the fourth is perfect. Thanks, John. Enjoy the celebration! Our corn is just over knee high here, Debbie. Happy 4th a day late. Glad you were able to see your son for a bit. We had so much fun … and did so much work! It’s always nice to have extra help, and I don’t think Domer minded *too* much using part of his vacay to get stuff done that needed doing. Hope your holiday was lovely, too! Really neat, Debbie. I love corn fields, my type of country. I don’t really know how the corn is doing in this area of Texas this year because I haven’t been out in the rural vicinity. We had a terrible time a few years ago with the drought which pretty much did all crops in. I hope you had a lovely 4th and a great time hanging out with Domer! I imagine a visit to your rural areas might be in order, Lana. There’s something healing about nature that our bodies and souls need! Yes, we had a wonderful holiday — hope yours was good, too! That corn looks so healthy. We’ve had so much rain this year so far. Get the butter ready for some great corn this summer. You look cute Deb! You’re kinda tall too. I’m 5’3. Seriously?? For some reason I expected you to be as tall, if not taller, than I am — wonder where we get these funny notions?! !